This TV Stand For 42" LCD TV Has Two Mounts for Televisions and Desk Space Too! 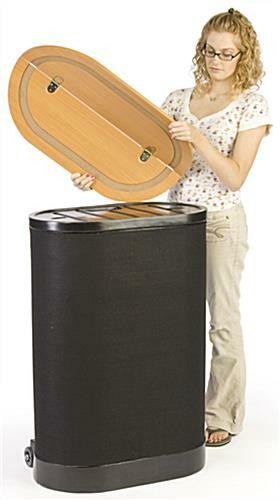 This TV Stand Includes a Case that Converts into a Podium with a Wood Counter! This TV Stand Ships Fast from the Warehouse! 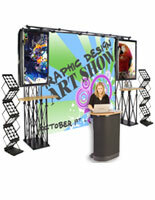 Tradeshow display holds up to (2) 60" plasma or LCD TVs weighing less than 80 lbs. each. 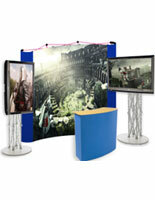 Portable display fits into rolling case for easy transport at events. (2) Counters for presenting to crowd or displaying additional informational pamphlets. Sold without graphic, but using our graphic dimensions (see Downloads tab), you can have one printed from a local printer! A TV stand has (2) 31" broad counters on every side of the exhibit. These counters tend to be excellent for exhibiting supplemental facts pamphlets, or it is possible to up to date at the entrance of the TV from one of these counters. 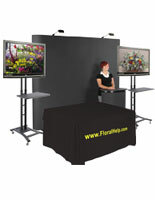 This moveable booth, TV stand has a close to 8' x 8' location to put a tailor made artwork alongside the back. 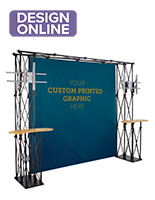 Utilize this banner artwork to attract even more awareness to one's own booth. 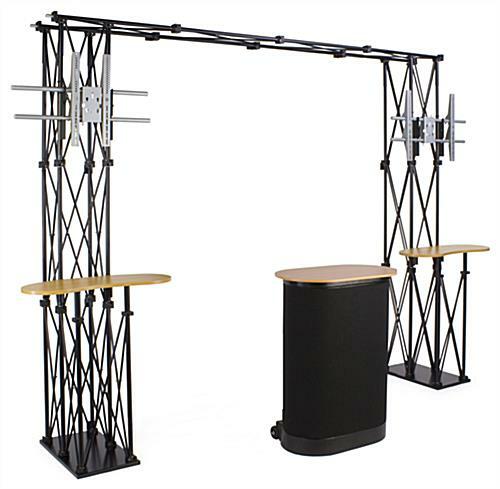 A TV stand for 42" LCD TV has a contemporary truss design with a black finish that brings a fashionable look to one's own company. Our company includes this TV stand with directions for not difficult fabrication, and also repacking the product into the travel case! 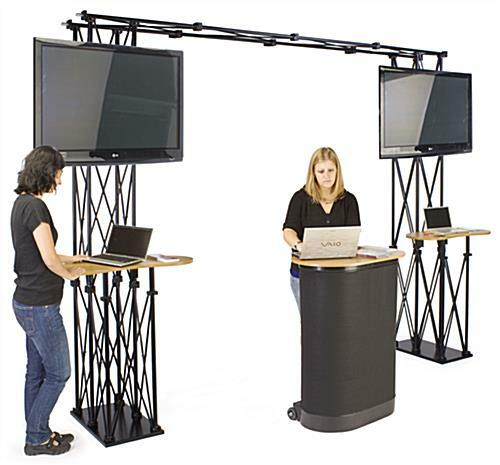 This moveable booth, TV stand is excellent for producing an interactive display that will draw clients into one's own company. Vibrant imagery and ample TVs effortlessly draw in clients. 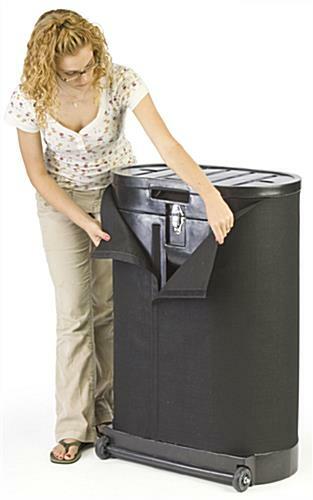 A TV stand can maintain an up to 60" plasma or LCD TV that weighs up to 80 lbs. It is possible to exhibit each TV choice in landscape or portrait orientation. 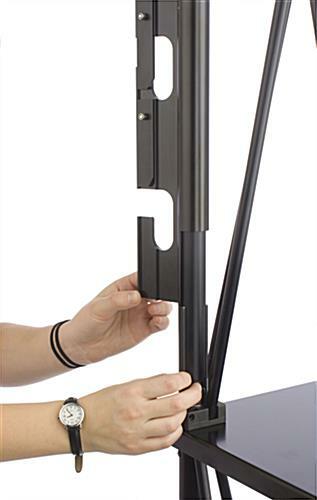 Utilize the spacers on every truss to lift your LG, Samsung, or other TV 3" on this TV stand. 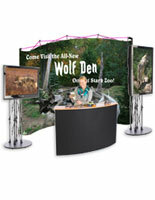 A TV stand, similar to moveable booth and a point of purchase up display exhibit. 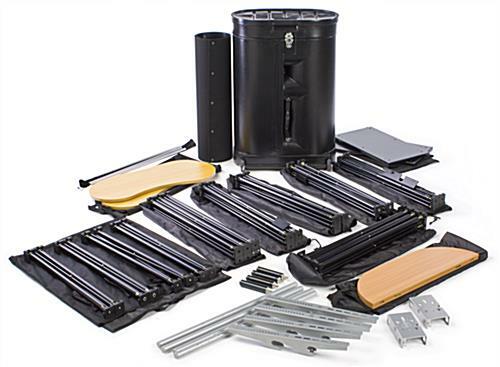 It all fits into a traveling case with wheels to effortlessly carry one's own exhibit to and from functions. 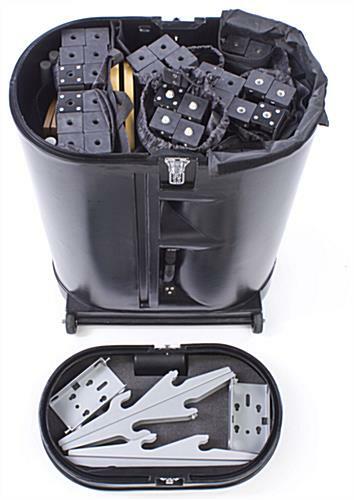 A tabletop and black wrap tend to be provided so it is possible to turn this travel case into a sales counter! 117.0" x 93.5" x 24.0"